An island situated off the southeastern coast of Bali in Indonesia, Nusa Penida falls in the district of Klungkung Regency. This beautiful Island invites you with its colourful underwater panorama, spectacular high coastal cliffs, and rugged hilltops in the high centre. Be adventurous in this blue paradise and enjoy snorkelling with Mantas, diving and hiking with amazing coastline views! Why should you visit the serene blue waters of this island? This Instagram-Famous T-Rex shaped rock formation at the Kelingking beach lives up to the hype, let me tell you. 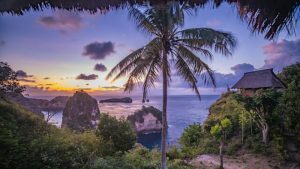 Hidden in the village of Bunga Mekar, on the southwestern coast of Nusa Penida island, it’ll take you 40-50 minutes to reach the Kelinking Beach. But I believe, you won’t mind the breathtaking views along the way. 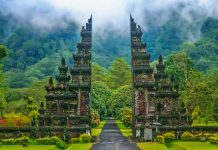 Locally known as Pura Goa Giri Putri, Goa Giri Putri Cave temple is perched midway up the mountain in Banjar Karangsari, Sauna village and is accessible by a steep winding staircase. 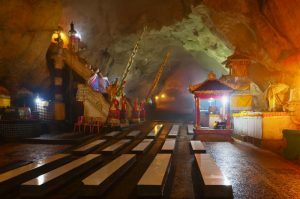 This magnificent cave is one of the largest caves in Nusa Penida and is a pilgrimage for Balinese Hindus. While the entrance of this 300 m long cave is deceptively small, you’ll be surprised by its greatness, grandeur and beauty. Situated at the eastern tip of Penida Island, Atuh Beach is a small, secluded bay with blue waters and white sand. You can enjoy your own ‘private beach’ with towering high cliff walls surrounded by various lime rock formations that only adds to its beauty. This stunning white beach has an arch sitting directly out from the shore while several islets string off in the distance. One of the most popular attractions in Nusa Penida, The Treehouse is perched up on the mountain at Thousand Island (Pulau Seribu) viewpoint. Rent the place for the night and make your stay charming. The tree rocks you to sleep while the moon shines over the water at night and the next day begins with the sun rising over the jagged islets, lighting up the entire bay in layers of orange, pink, and gold—HOW DREAMY IS THAT? Up for some walking? How about 700 blue stairs? The entire walk is more spectacular than the falls themselves! 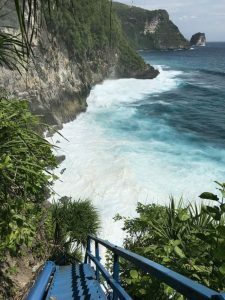 These stairs on the southwest coast of Nusa Penida will lead you to the down to the waterfall and the sacred temple. More of a religious shrine than a waterfall, you’ll get to see the spectacular coastal cliff views and have a spiritual experience while watching the powerful waves smash into the cliff face in a powerful display. Don’t miss out snorkelling at this cove with clear blue water! Crystal Bay is the perfect place accessible with a motorbike where you can just relax, go for a swim or watch the beautiful marine life in these clear waters of Crystal Bay. 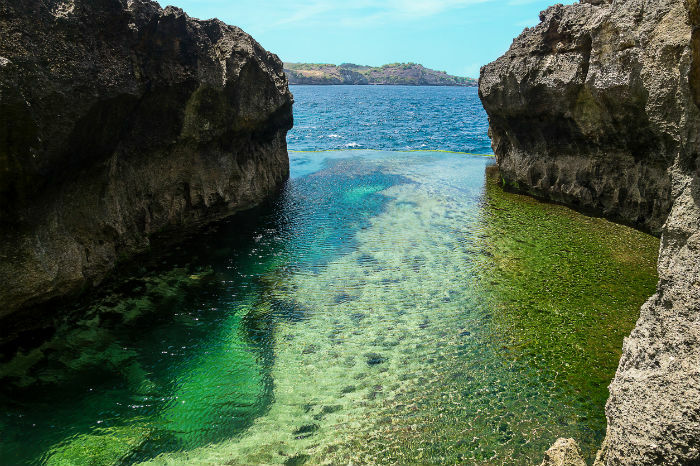 One of the magical spots in Nusa Penida, Angel’s Billabong is a crystal clear natural pool that meets the ocean while limestone cliffs frame the crystal clear water. This natural infinity pool will let you witness the Manta Rays cruising out at the coast. Yay? Best viewed at low tide, the Billabong is a truly a remarkable formation. Marvel at the crystal clear tide pool that cascades into the ocean allows you to see the patterns and textures beneath the surface. Be careful while climbing down for a swim as here, the tide can be unpredictable and the waves ferocious. 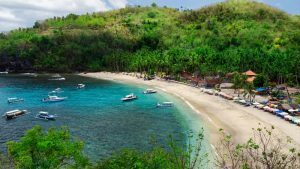 Just a short walk from Angel’s Billabong is an incredible little cove on Nusa Penida island. This remarkable cove is called Broken Beach due to the archway that wraps around the bay allowing water to flow in and out from the ocean. Be ready to be awe-struck by this walk-over-bridge as the ocean water flows into a natural bowl that is surrounded by towering cliffs. Broken Beach is a beautiful natural formation but unfortunately, you can’t go down and go for a swim because it’s quite high and there’s no access point to the water. A true spectacle in itself, enjoy the vastness of the ocean with different viewpoints while taking a panoramic walk all the way around Broken Beach. Also known as Pulau Seribu (literally translating to Thousand Islands), this viewpoint is a stairway down which will take you about 5 minutes. 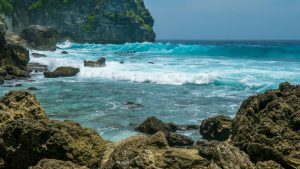 While there are several viewpoints along this walk, there are generally two which give you different angles of the beautiful eastern rock formations and crystal blue Bali Sea. You reach the first one after climbing down the steep stairway for about 10 minutes. Get incredible views of see a small empty beach sitting at the bottom of the cliff. Paradise, no? The second one is up and past the Rumah Pohon Treehouse. This view on the 200-meter high cliffs and white-sand beaches are just one to take in for a moment. Out of a movie, right? You have to save at least one sunset for Banah cliffs! 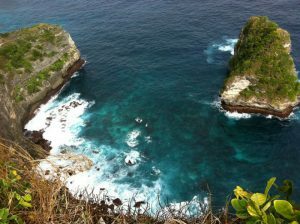 One of the roughest and rockiest treks in Nusa Penida leads us to Banah Cliff Point. Facing east, it offers some of the best sunset views on Nusa Penida. The highlight would be a small rock arch sitting out in the crystal clear water. Away from the tourist hot spots, head down to the Tembeling Natural Pools which are set nicely below the large cliff wall. This beautiful blue watered gem is hidden away in the jungle making it almost inaccessible. Just a 5-minute walk from the natural pool is an explorer’s dream. Tembeling beach, which is a little hideaway bay located on the southwest side of Nusa Penida. Relax for a few hours at this white-sand beach and Don’t forget to have a look at the secret beach on the other side of the cove. 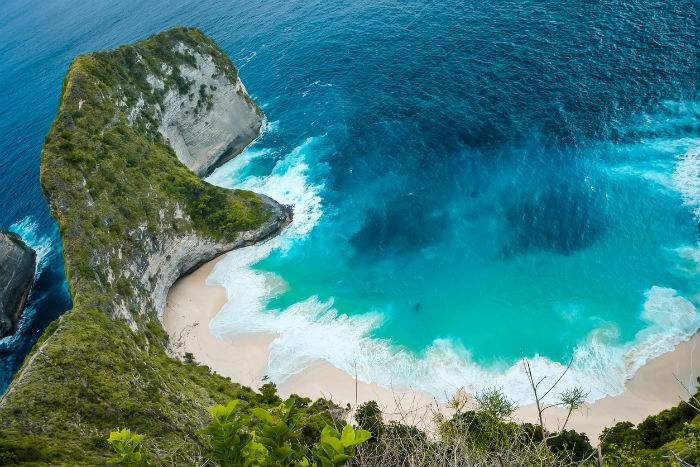 This fairly secluded beach can be considered one of the most underrated beaches in Nusa Penida. If you are up for a little exercise, this white sand offers huge towering cliffs. 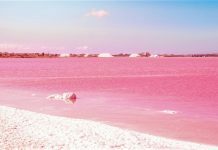 There is also crystal clear yet strikingly blue water; an insane staircase down to the beach and maybe a turtle or two. Although, an earthquake in 2018 ruined the stairs; but by the end of the year, the locals fixed them enough to make the access possible. 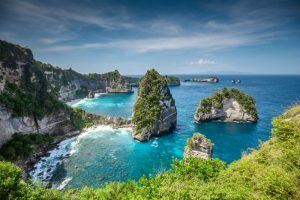 Still, need more reasons to visit Nusa Penida?